Malathi Holla, one amazing Indian sportsperson; an excerpt from Tulika Books’ India At The Olympic Games, focusing on the Paralympics. The 2012 Summer Paralympic Games is the 14th Paralympics. It will be held in London between 29th August 2012 and 9th September 2012. When Malathi Krishnamurthy Holla was selected to represent India at her first Paralympic Games, in Seoul 1988, she was ecstatic. The track and field athlete, known for her 100m and 200m finishes, was also a whiz at shotput, javelin and discus. Since then, Malathi has represented India at the Paralympic Games in Barcelona, Athens and Beijing, the Asian Games in Beijing, Bangkok, South Korea and Kuala Lumpur… She has won over 300 medals at national and international events. She has also had over 30 surgeries for broken bones in her legs. When she was a baby, polio paralysed her whole body. Electric shock therapy for two years helped the upper body regain strength. But below the waist, little Malathi wasted away. Her father was determined she should grow up to be self-reliant and confident. He made sure she got a sound education, the sort she needed, even if it meant sending her away from Bengaluru to a special school in Chennai. There she developed the parts of her body that were strong, and got interested in wheelchair sport. She also learned to be independent. It was never easy but Malathi was a fighter. For instance, at college in Bengaluru, when she found that all her classes were on the upper floors, she went to the principal, explained the problem and asked if her classes could be moved to the ground floor. They were! Malathi loved the challenge of competitive sport. She trained hard, even though she didn’t have the most important piece of equipment for a disabled athlete – a racing wheelchair. Usually, professionals don’t share their equipment because it is a competition, after all, and each item is tuned for an individual athlete’s needs. Shehnaz Kirmani was different. She was a champion athlete, also affected by polio. She met Malathi at sports meets and began to see how talented she was. Shehnaz soon became the wind beneath Malathi’s wings, helping her in whatever way she could, even sharing her wheelchair. Malathi used it for many years, winning medal after medal. Then, one wonderful day in 1981, Malathi had a special gift from Shehnaz – her own racing wheelchair! 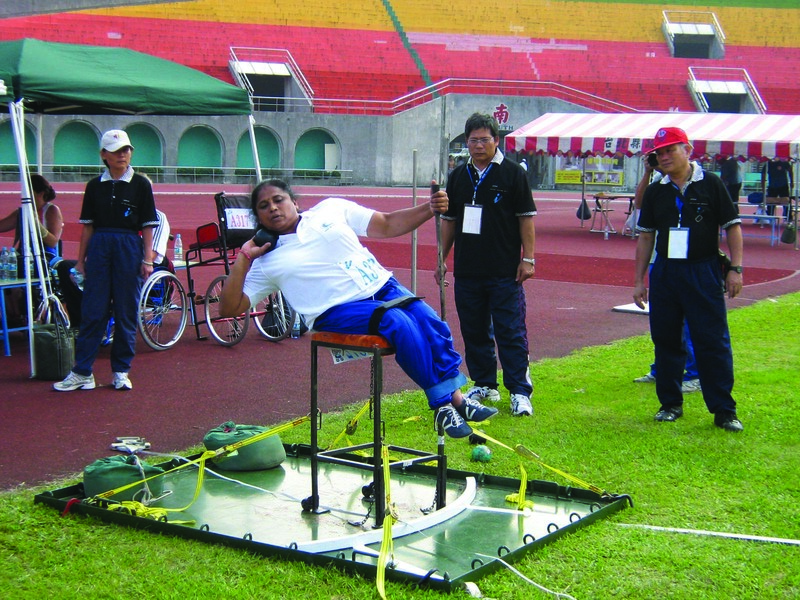 At the international level, though, sports wheelchairs were much more sophisticated and beyond Malathi’s reach. Indian teams rented them but only for a few days, which gave them little time to practice. Once again, Malathi found a friend. During the World Masters in Denmark, John Ebbick, a Danish participant and Malathi’s competitor, gave her his wheelchair to use. It was a special racer item, new to her, and John took time off to teach her how to manoeuvre it. And it was on this wheelchair that Malathi won her first international gold medal in 1989 – a win, too, for friendship! I took up sports and decided to do something different in life. Yes, we are different and so even our lives should be a shining example of that difference. – Malathi K. Holla, at the release of her book, A Different Spirit. – Born on 6 July 1958 in Kota, Karnataka. – Received KK Birla Award and Eklavya Award from Karnataka Government in 1995. – Named Woman of the Year, 1999 by American Biographical Institute, USA. – Named International Woman of the Year by International Biographical Centre, Cambridge, UK, in 1999. – Received Padma Shri in 2001. First disabled person to receive this award. – Works with Syndicate Bank and runs Mathru Foundation for polio affected children in Bengaluru. Malathi set an Indian women’s record for 200m at the finals of the 1988 Seoul Games with a timing of 56.19secs. It was para swimmer Anthony Pereira who inspired Malathi to do throws because of her broad shoulders. Discus and shotput are now her favourite events. Paralympic athletes are classified according to the type and extent of disability, so that they compete with those on a similar level. The kind of equipment they may use as aids – wheelchairs, artificial limbs, rope tethers linked to guides, etc. – is specified by IPC rules. Thanks for posting this excerpt, Womensweb. I volunteer at the Spastics Society school, and this will be an inspiring story to share with our children.